We had art class at home again last weekend. This time Tomas had us all do drawings based on the rubber shark who lives in the bathtub (and who I can’t find today to take a picture of!). 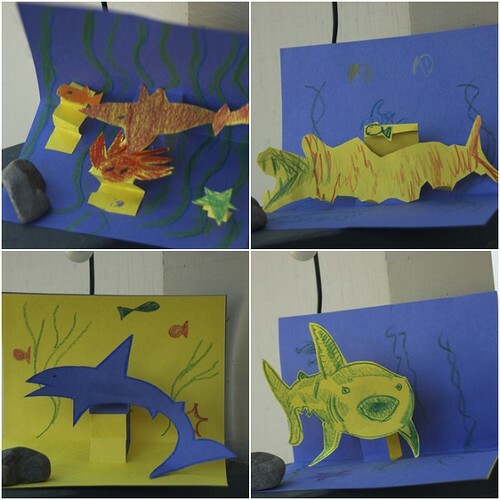 The pictures above are of the last assignment; to make a pop-up card based on Sharky in his native habitat. Draw Sharky with just one zig-zag line. Draw Sharky using 5 circles, 5 triangles, 5 squares, and 5 diamonds. Draw Sharky with one single line. Do not lift up your pencil/pen/crayon. Draw Sharky using just 20 straight lines. The catch was that you had to do your drawing based on your specific view of the shark — very hard to do in practice! It was fasciinating to discover how we each interpreted the assignments differently.